They say that humans only use 10 percent of our brains. They go on to say that the claim that humans only use 10 percent of our brains—in addition to being a major plot point of the delightful Albert Brooks movie Defending Your Life—is a myth. Truly they cannot be trusted on this matter, but this much is clear: 98 percent of Rams head coach Sean McVay’s brain is jammed up with high-definition memories of old football plays. Eventually this is going to get old, but we are just nowhere close to that point today. 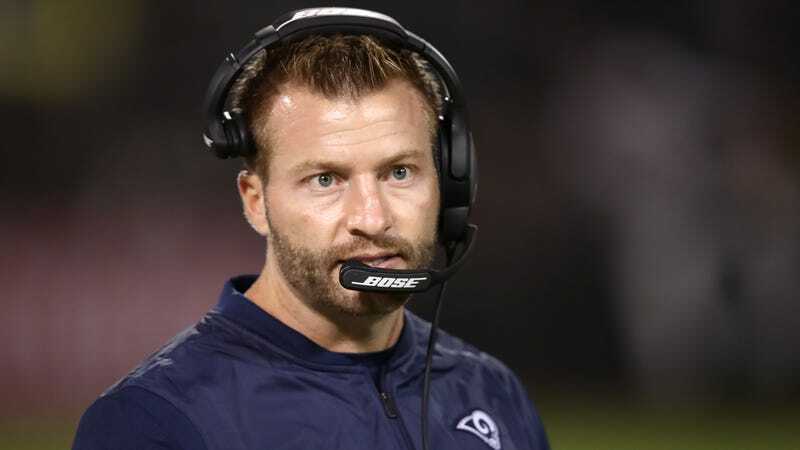 I demand that Sean McVay not be allowed to show his face in public without someone asking him to describe a play from some point in his coaching career. We must not stop until his entire history in football has been recited, formation by formation, yard by yard.